I have been hearing from many that midway during pregnancy I will feel a "high" like no other. 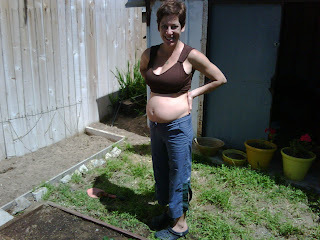 Today it set in and what a relief, because truthfully the beginnings of the pregnancy was anything but. This past weekend I led a 3 day NGY Teacher Training...13 women, 10 of which were moms of young ones. I felt so loved and supported, with lots of wisdom learned. I know the Law of Giving & Receiving was in full effect, because they loved the training and my offerings, and I too learned and received so many blessings. Today I feel like a new pregnant woman! I feel light, inspired, creative, motivated, powerful and peaceful. In celebration of feeling good, I planted lots of veggies, herbs, strawberries and flowers in the garden, made my first roast chicken, got a haircut and am on my way to teach an adult Yoga class at the Chopra Center. I always had it in my mind that I would LOVE being pregnant. In fact I could hardly wait for that time in my life to arrive. Well now that it is here...I have to admit, it doesn't feel what I dreamed it to be. My body is changing and I am not in control, in fact I hardly even recognize it. It's little things surprise me. I feel sore from gardening yesterday, I get out of breath easily when I walk Chants and my heart rate soars when I lift up from tying my shoes. I'm not saying I don't love it, I do. David reminds me to LOVE what challenges me. By opening that channel and allowing positivity in will release attachment and resistance. "Kiss it" he says. SO even though being pregnant feels challenging to me, YES, I do love it!! Last nights Yoga class is one I'll remember for the rest of my life...David proposed to me. It was perfect...being in the same place where we first met, where we first said 'I love You' and now where we first said 'Yes' I will marry you. The class of 30 people, including dear friends, and our spiritual teacher truly held sacred space for us. In conclusion, we were blessed and recieved open palms and a powerful "Ohm."